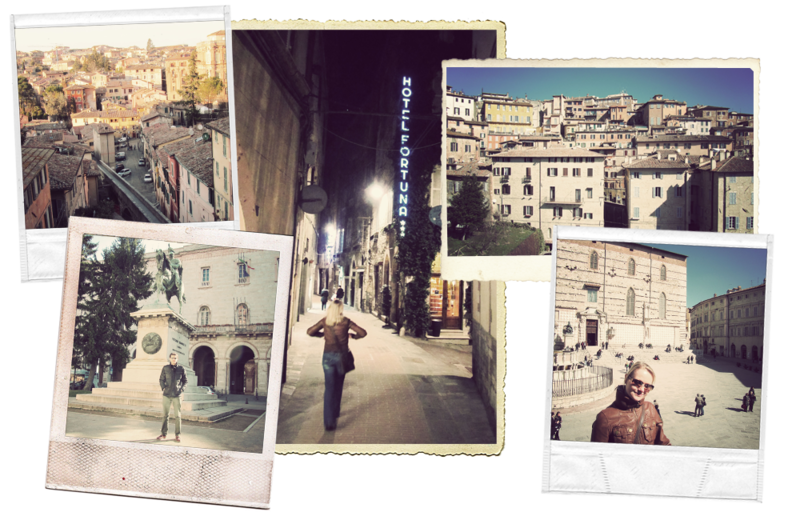 With my impeding 32nd Birthday imminent, we headed back to Italy as has been the recent tradition. 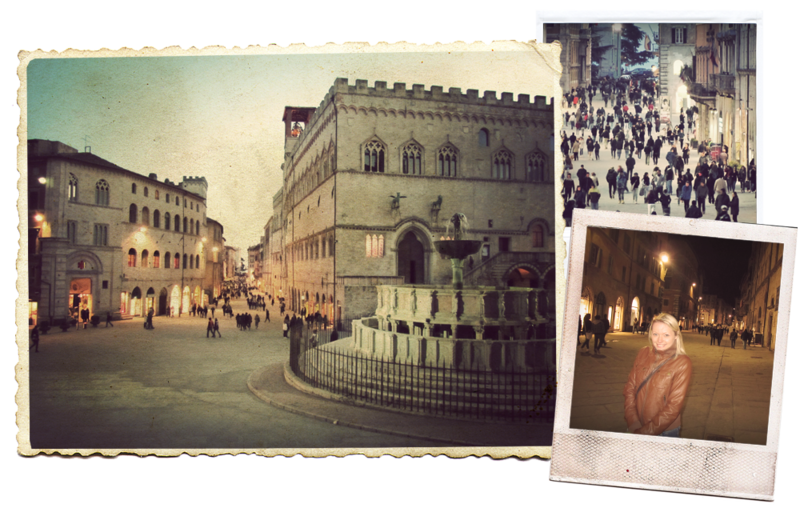 Umbria and its capital Perugia was our base for this visit. Despite the numerous online forums complaining about the difficulty of getting a public bus from the airport to the city centre, it proved remarkably pain free and inexpensive, albeit with a few basic words of Italian. The Hotel Fortuna, our base for the trip, was right in the centre of the historic old town, tucked way down a back street just off main Piazza Italia and Corsa Vannucci. Having checked in (and checked the room out) we headed back out for a little stroll in the late afternoon sunshine. Blessed with blue skies in every direction and a howling gale that also seemed to stem from every direction, we gathered our bearings on the small but charming main piazza. 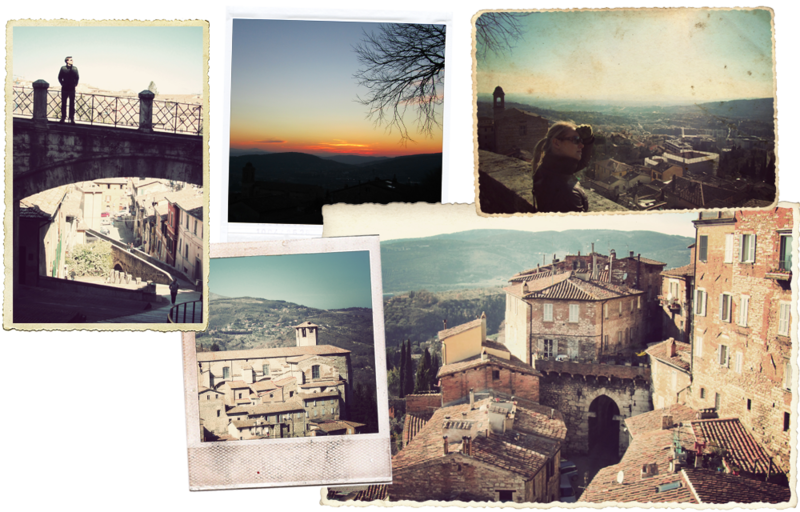 Its hillside location was once its greatest defence, while these days offering spectacular vistas of the local Umbrian countryside, it's easy to see why Perugia attracts the tourist busses. Unfortunately, the long day and warm bus ride combined with shaking off an old bug had made me feel very unwell. So much so, that even a warm plate of Tortellini and Guinness (it was an Irish bar ironically) couldn’t stave off some much needed sleep. In what was possible the earliest ever bedtime recorded, lights were out at 9.00pm! After a long nights sleep and a good continental breakfast, I felt considerably better despite the passing of my 32nd Birthday! Likewise outside the blue skies persisted as did the howling wind. 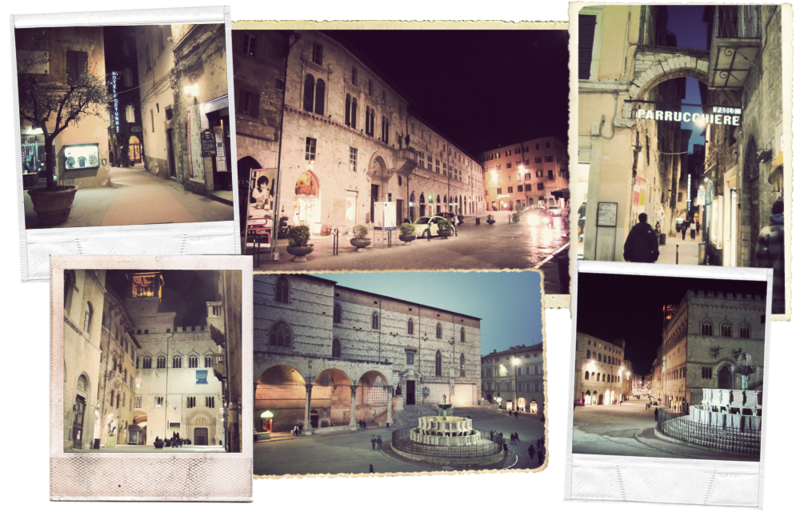 The centre of Perugia is accessible by foot and can be explored easily within 24 hours. Having ticked off several of the more obvious sites we sat under the shade of the Cathedral and grabbed a bottle of water. Unfortunately we weren’t alone and the pigeons above said ciao by defecating on my leg! At least the water came in handy. 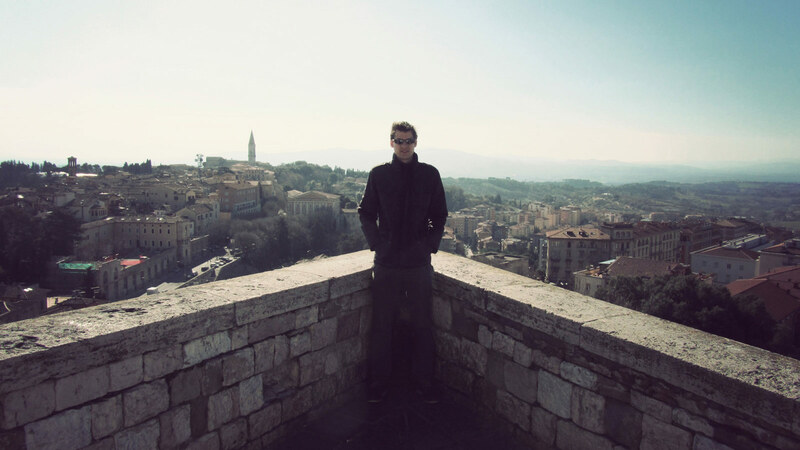 The old city walls and back alleys of Perugia are a photographer's dream with angles and stunning views a plenty. Every twist and turn around the hillside opens up a fresh vista. With a maze of tunnels dating back before Roman times the city is also a historian's dream with layers upon layers of the city past on display. The Rocca Paolina, a 16th century which no longer exists but occupied the area nearby the Piazza Italia, offers one of the more unusual escalator journeys. The stairs go straight down into the ancient medieval streets of Perugia, now covered by soil and buildings. The streets are still used to this day as a thoroughfare and shop stalls. The Roman aqueduct which is now a footpath near the University, offers some great photo opportunities due to its inter twining route under arches and above houses. Walking along it is a surreal experience, as you gaze into third floor windows! 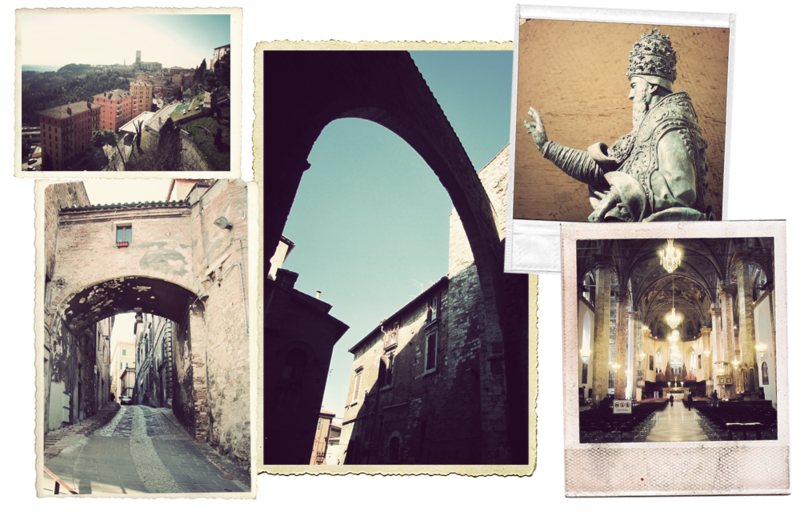 The Corsa Vannucci is the main artery of the town, connecting the stunning views near Piazza Italia, past the Cathedral and into the tiny cobbled back streets. Dusk offers time for the great Italian tradition of Passeggiata, with people sitting around on the steps of the Cathedral in the main piazza. 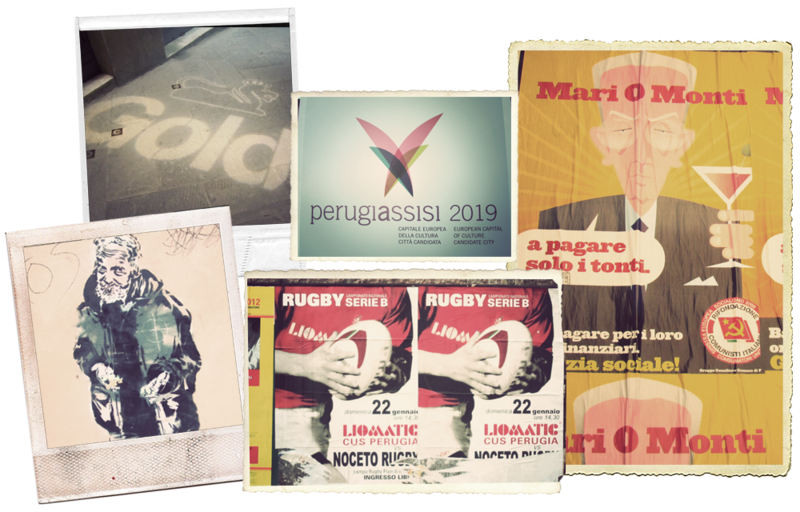 Despite the International University, Perugia was the first place we visited in Italy, where English wasn’t universally spoken or guaranteed. Not that English wasn’t understood, but the locals seemed quite happy for me to bumble along in Italian without resorting to English straight away. For the most part I was understood despite missing out on a soup one evening – you can’t win them all! 05 /. Various portraits of us including Clare cleaning bird poo! With a day trip to the surrounding area planned, we headed for the train station which was about 2 km from the town centre. 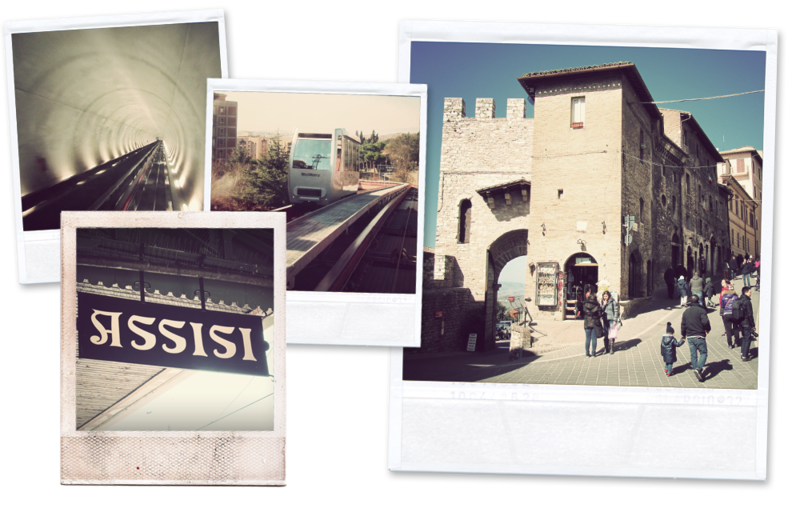 This gave us the opportunity to use the Mini Metro Railway which is monorail line running from the outskirts of town to the city centre. Both over and underground, the unmanned carriages run every 2 mins for a euro, saving a steep walk. 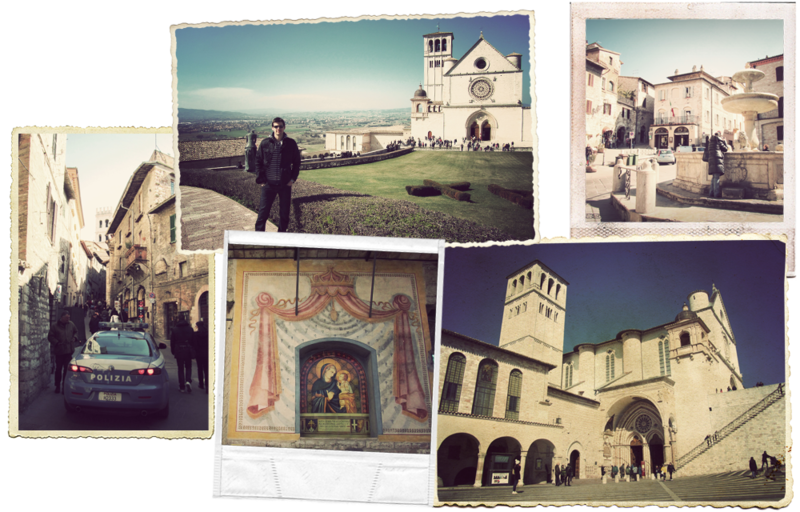 Assisi, the town synonymous with Francesco was our first stop. 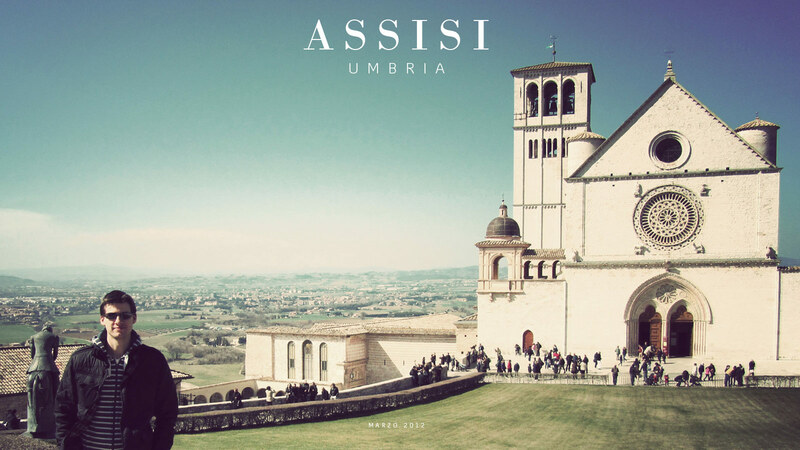 Along with half the population of Umbria it seemed, we made our way to the famous monastic buildings. Unfortunately as it was Sunday morning there was a service in full swing. It seemed inappropriate and intrusive to linger too long although many visitors continued obliviously. 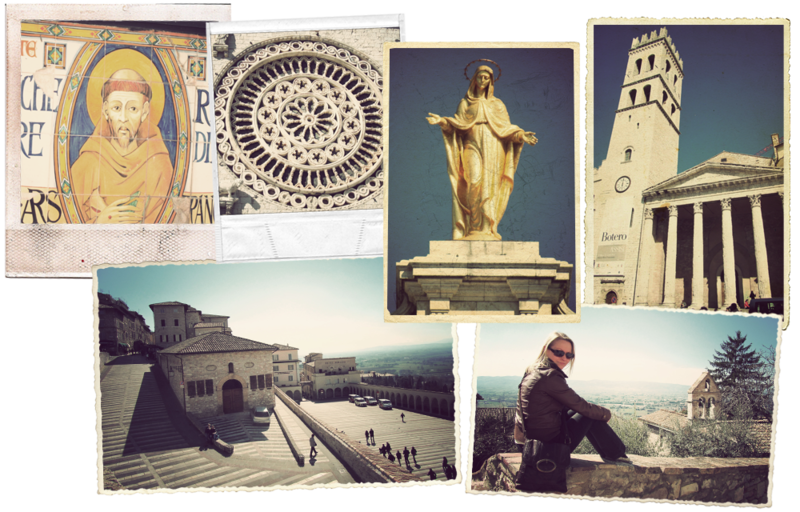 Having taken the obligatory tourist shots we climbed the narrow streets to the heart of Assisi. Deceptively bigger than it first looks, the town is charming but with a keen eye to cash in on its most famous resident. 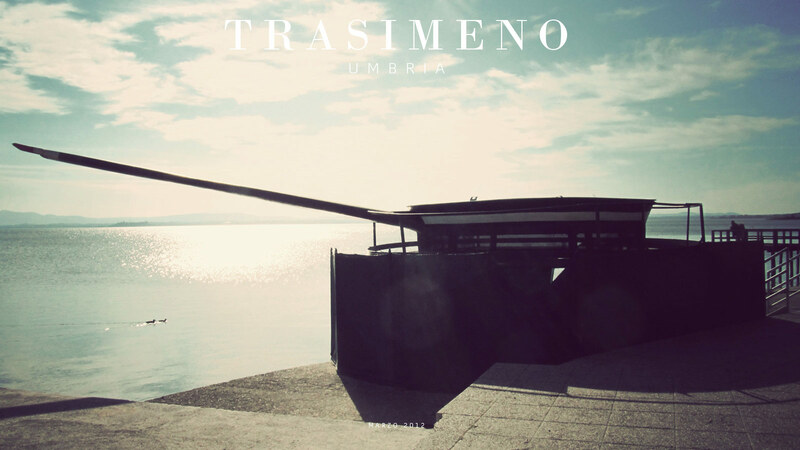 Having spent the morning in Assisi we travelled back across the Umbrian countryside to the shores of Lake Trasimeno, one of the largest inland lakes in central Italy. 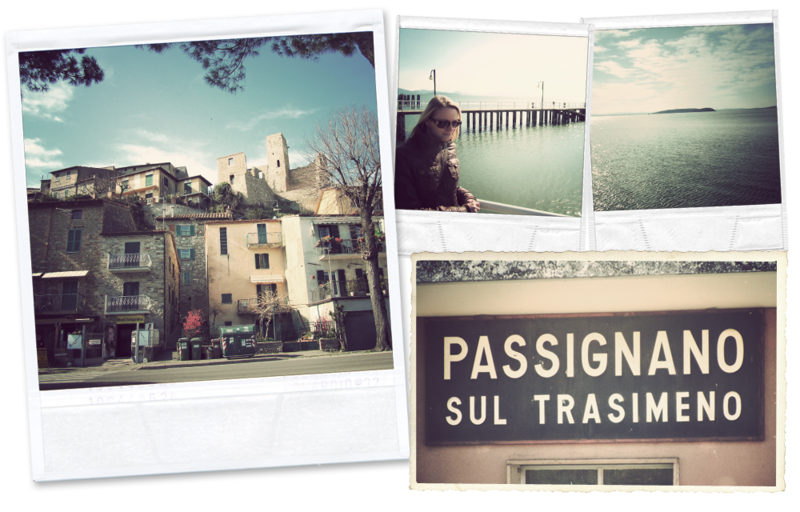 Having disembarked the 13:17 train from Assisi at the small lakeside town of Passignano Sul Trasimeno, we headed for its sleepy centre by the lake shore. Hungry and in need of refreshment we grabbed a Panini and basked in some genuine heat from the sun. Even the odd Italian took off their scarf! The Sunday afternoon weather brought out the local families, joggers, dog walkers and those just in need of some quiet time by the water. The tranquil atmosphere was a million miles away from the hustle and bustle of the tourist crowds in the morning and a very pleasant place to while away a few hours. 04 /. Possibly the worlds biggest frying pan? 07 /. 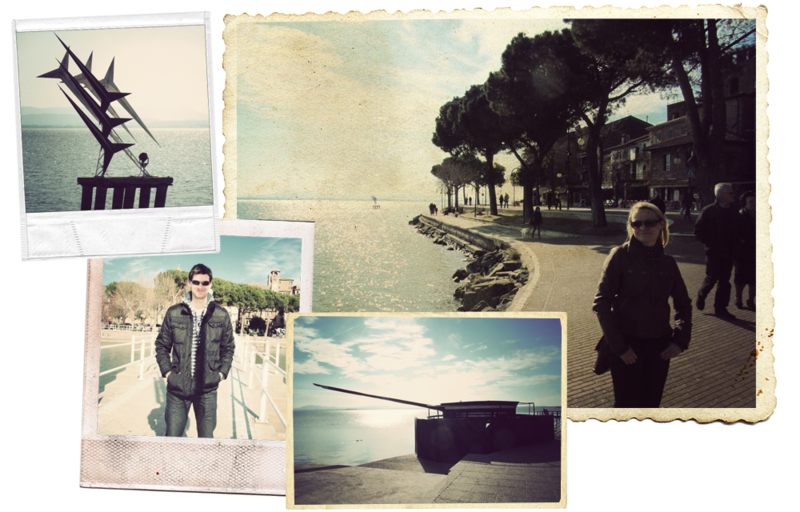 Lake Trasimeno itself!